The federal government expanded dramatically in the 20th century and has continued growing in the 21st. Between 1900 and 2012, federal government receipts increased from 3.0 percent of the economy’s output to 16.5 percent, and federal expenditures rose from 2.7 percent of economic output to 24.0 percent. State and local governments have also expanded relative to the rest of the economy, although not nearly as much as the federal government. Between 1930 and 2012, state and local government receipts grew from 8.0 percent to 13.0 percent of economic output, while their expenditures rose from 9.1 percent to 14.8 percent of output. For the overall government sector from 1930 to 2012, receipts increased from 11.1 to 26.4 percent of gross domestic product, (GDP) and expenditures rose from 12.1 to 35.6 percent of GDP. This Fiscal Fact provides an overview of these long-term trends. The U.S. Bureau of Economic Analysis (BEA) supplies annual data going back to 1929 in the National Income and Products Accounts (NIPA) on the receipts and expenditures of the federal government, of state and local governments, and of the overall government sector. BEA also provides annual NIPA data beginning in 1929 on the U.S. economy’s gross domestic product (GDP). These numbers were used to compute total revenues and expenditures relative to the size of the economy for each year during the period 1930-2012 for the federal government, state and local governments, and the overall government sector. The federal government series were extended back to 1900 by drawing on two additional sources. One is yearly data from the U.S. Department of the Treasury on federal receipts and expenditures for 1900-1929. Another is a set of estimates from the National Bureau of Economic Research on U.S. gross national product (GNP) for each year in the period 1900-1929. The NIPA data does not precisely match the numbers in federal, state, and local budgets because of various methodological differences between how BEA calculates the NIPA data and how state and local government compute their budget numbers. The advantage here of using the NIPA data for 1930-2012 is that it furnishes a long time series of state and local government data, and it reports the numbers for the various levels of government on an internally consistent basis. As a related point, there is a break in the federal series between 1929 and 1930, because the earlier data do not come from NIPA. (The NIPA and non-NIPA data sets were compared for 1929, and their results are close but not identical.) Still, the numbers on both sides of the break tell the same story: the federal government was very small then compared to today. Government receipts and expenditures are expressed here as shares of economic output, because the size of the economy is an important determinant of the demand for government services and the ability to support those services. For example, taxes of $100 billion would be a crushing load in a $150 billion economy but much less of a problem in a $600 billion economy. However, it should be noted up front that the size of government is only one of many factors that impact the burdens and benefits of government revenue and spending programs. For example, for a given amount of government revenue, the public will be better off if the government relies on taxes that are simple rather than complex (to lessen taxpayers’ paperwork burdens), visible rather than hidden (to let citizens/voters accurately gauge the costs of government services), honestly administered (to uphold fairness and minimize corruption), neutral between consumption and saving (for fairness and to promote growth), and structured to keep marginal tax rates low (to reduce economic distortions that slow growth). Similarly, on the outlay side, the amount of government spending matters greatly but does not reveal, among other things, whether projects are managed efficiently or wastefully, whether programs generate benefits that exceed their direct and indirect costs, whether the government has prioritized high-value projects ahead of low-value ones, and whether spending programs meet broad public needs or direct subsidies to political allies. The numbers here also do not include most of the costs and benefits of government rules and regulations. Although there is much uncertainty about their dollar amounts, the costs are certainly large and rising. For example, one study estimated the regulatory costs imposed by the federal government were $1.8 trillion in 2013, which would be well over half the size of, and in addition to, the federal taxes and other receipts reported in the NIPA data. For an indication of the growth of government rules and regulations, consider that the federal tax code has mushroomed from 400 pages in 1913 to 73,954 in early 2013. 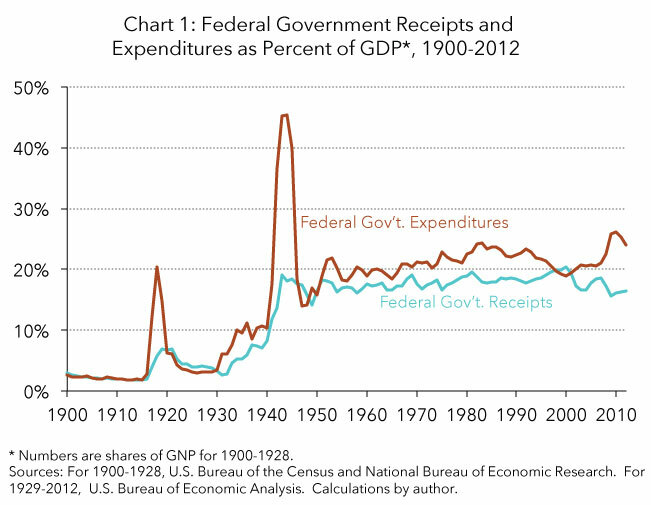 Chart 1 shows the federal government’s receipts and expenditures, expressed as percentages of economic output, from 1900 through 2012. Table 1 provides snapshots at ten-year intervals. The chart and table offer several takeaways regarding the long-term path of federal government revenue and spending. Until the 1930s, the federal government was extremely small compared to the present. The federal government once concentrated on a few tasks, such as providing for the national defense, administering a relatively small set of federal laws, and operating a national mail service. Although not shown on the chart or table, the federal government raised most of its money from customs duties and excise taxes up until 1917. Prior to the 1930s, the federal government during peacetime generally balanced its budget or ran surpluses. From 1900 to 1916 (just before the country’s entry into World War I), federal receipts and expenditures both averaged 2.1 percent of economic output. Federal spending and federal budget deficits typically soar during major wars. Federal expenditures climbed to 20 percent of national output during World War I—an approximately ten-fold increase from its pre-war level—and hit 45 percent of GDP during World War II. Although federal outlays quickly fell after World War II (to about 14 percent of GDP), they jumped by more than half with the Korean War (to nearly 22 percent of GDP). The failure of federal expenditures to drop sharply after the Korean War was probably due in large part to the prolonged Cold War. The federal government has historically enacted steep tax increases during major wars, but most past wartime spending has been deficit financed. Federal receipts and expenditures have been permanently higher since World War II than they were before that war. For example, average federal expenditures during the period 1950 to 2006 exceeded the maximum level of spending at the peak of World War I. * GNP, not GDP, for 1900, 1910, and 1920.
and S&L series. The NIPA accounts net them out in the series for the Total Government sector. Sources: For 1900-1920, U.S. Bureau of the Census and National Bureau of Economic Research. For 1930-2012, U.S. Bureau of Economic Analysis. Calculations by author. While much higher than before, federal government receipts and expenditures stayed within relatively narrow bands from the midpoint of the 20th century until just before the Great Recession. During the period 1950-2006, federal receipts averaged 17.9 percent of GDP, and federal expenditures averaged 20.9 percent of GDP. In the severe 2007-2009 recession and its aftermath, federal spending climbed higher than at any time since World War II, and federal revenue dropped to a level last seen in the late 1940s. Federal expenditures peaked at 26.2 percent of GDP in 2010 (5.6 percentage points above the 2006 value) and federal receipts bottomed out at 15.6 percent of GDP in 2009 (2.9 percentage points below the 2006 value). In part, these movements reflect the sensitivity of federal spending and revenues to the health of the economy, combined with the recession’s severity and the recovery’s weakness. However, the increase in spending is greater than would have been expected based on economic factors alone. In 2011 and 2012, federal spending began falling, though it remained high, and federal revenue began rising. According to NIPA data for 2013 (not shown on the chart), total federal spending was 23.3 percent of GDP in the first three quarters of 2013, which is still 2.7 percentage points above its 1950-2006 average, while total federal revenue was 18.2 percent of GDP, exceeding its 1950-2006 average. To summarize this section, federal receipts and expenditures increased several times over relative to the rest of the economy in the first half of the 20th century. Their totals then stayed within moderately narrow ranges for almost the next sixty years. With the Great Recession, spending burst out of its prior range, and the deficit rose to an unprecedented level for peacetime. Today, both spending and the deficit remain very high but are declining. Chart 2 depicts state and local governments’ receipts and expenditures, expressed as percentages of GDP, from 1930 through 2012. 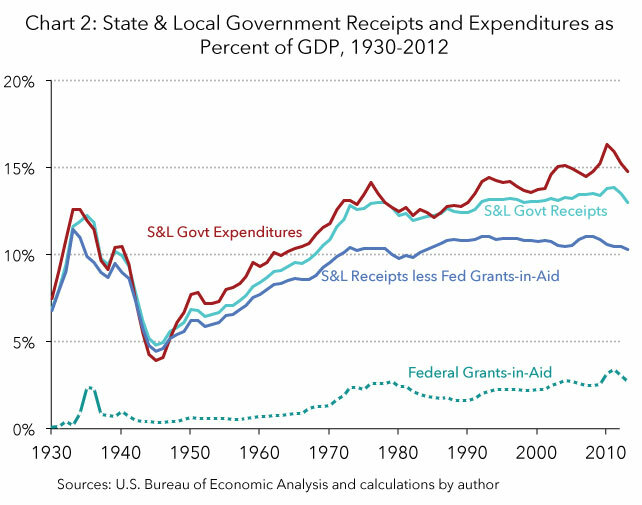 Additionally, to discern the monies that state and local governments raise themselves, Chart 2 also shows state and local receipts net of federal grants-in-aid. In the first half of the Great Depression, state and local receipts and expenditures increased relative to the overall economy, as shown on Chart 2. However, most of that reversed in the second half of the 1930s. The year 1940 was notable because it was the last time state and local government revenues and outlays were roughly on a par with those of the federal government. State and local governments’ share of the economy shrank during World War II, probably because so much of the nation’s output was conscripted by the federal government for the war effort. After World War II, state and local government revenues and outlays began a long climb. By 1975, state and local government receipts were 12.9 percent of GDP (3.6 percentage points higher than in 1940) and expenditures were 14.1 percent of GDP (4.7 percentage points higher than in 1940). In the late 1960s and early 1970s, during the Johnson and Nixon Administrations, federal grants-in-aid became a more important funding source for states and localities. This can be seen in Chart 2 by the rise in the line representing federal grants-in-aid and by the widening of the gap between state and local government receipts with and without that aid. On the expenditures side, the outpouring of federal money has increased the federal government’s influence and induced state and local governments to spend more than otherwise. State government receipts and expenditures were once small compared with those of local governments. The NIPA statistics consolidate state and local government finances and do not show the levels individually. However, some Census Bureau surveys report state and local government finances separately. The Census information is used here to augment the NIPA statistics. In 1902, local government revenues and expenditures were approximately five times as large as those of state governments. In 1932, the local-to-state ratio was approximately 3 to 1. In 1970, the local-to-state ratio was about 1 to 1. The Census Bureau reports that local revenues and expenditures were slightly less than those of state governments in 1991-1992. In 2011, the local-to-state ratio was approximately 0.8 to 1. These numbers actually understate the growing influence of state governments over local ones because state transfers to local governments have risen from roughly 5 percent of local revenues in 1902 to roughly 30 percent in 2011. In summary, between 1930 and today, state and local governments grew relative to the overall economy but not as quickly as the federal government. In 1930, the state and local levels of government dominated in terms of receipts and expenditures, but now the federal level is dominant. There has also been a shift from the local level of government to the state level. Chart 4 presents the time paths of receipts and expenditures for all levels of government. The patterns are similar to those for the federal government except the totals are higher. Government revenues and outlays have not continuously expanded, however. Government expenditures returned in the last half of the Clinton administration to approximately where they had been in the 1970s, and government revenues similarly returned in the early part of the Bush administration to about their level in the 1970s. Since 2006, though, government outlays have jumped sharply, claiming over 38 percent of the nation’s economic output in 2009 and 2010. The government sector’s deficits have also surged and were over 12 percent of U.S. economic output in 2009 and 2010. When examining long-term trends, it is natural to wonder what the future holds. The NIPA data only displays past events. 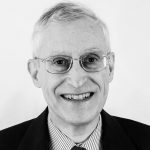 However, two considerations suggest that federal taxes and spending, and to a lesser extent state and local taxes and spending, may be poised to increase substantially. One consideration is the Patient Protection and Affordable Care Act, more widely called Obamacare, which is still in the process of being rolled out and which includes an array of major new federal taxes, fees, requirements, and government assistance programs. Obamacare will also put upward pressure on state government spending. The other consideration is the aging of the population, which has huge budget implications on both the tax and spending sides, because the federal government has promised Social Security and Medicare benefits to seniors without setting aside any real assets to redeem those promises. The federal government also has not funded some of the benefits it promises to federal workers after they retire, and many states and localities have inadequately funded their workers’ pensions. If the government sector expands further, it will become even more vital than it is already to trim unnecessary or low-return spending programs and to strive for simplicity, economic efficiency, and transparency in tax policy to grow the economy. U.S. Bureau of Economic Analysis, National Income and Product Accounts, Table 3.2. 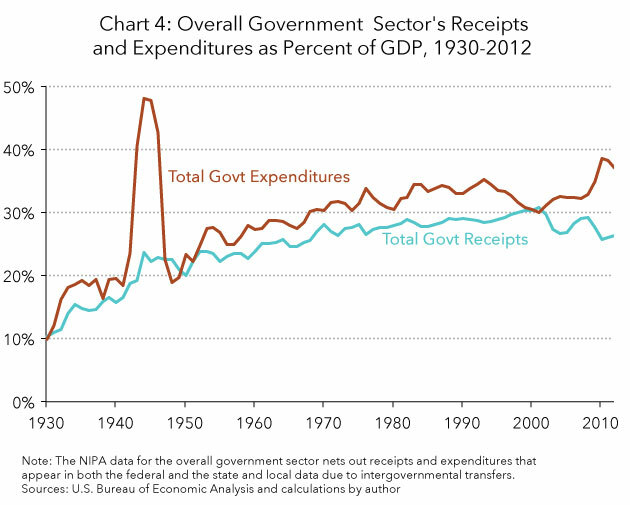 Federal Government Current Receipts and Expenditures, http://bea.gov/iTable/index_nipa.cfm. U.S. Bureau of Economic Analysis, National Income and Product Accounts, Table 3.3. 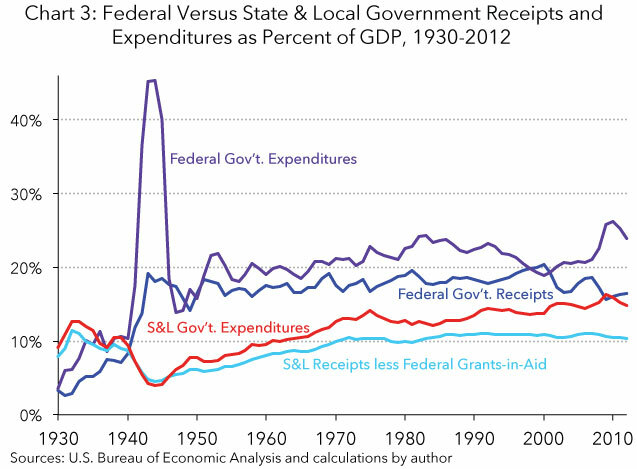 State and Local Government Current Receipts and Expenditures, http://bea.gov/iTable/index_nipa.cfm. U.S. Bureau of Economic Analysis, National Income and Product Accounts, Table 3.1. Government Current Receipts and Expenditures, http://bea.gov/iTable/index_nipa.cfm. U.S. Bureau of Economic Analysis, National Income and Product Accounts, Table 1.1.5. Gross Domestic Product, http://bea.gov/iTable/index_nipa.cfm. To obtain the federal government’s total expenditures, the author imputed two small entries: capital transfer payments for 1929-1936 and net purchases of non-produced assets for 1929-1959. The author imputed two small entries to obtain the overall government sector’s total expenditures: capital transfer payments for 1929-1936 and net purchases of non-produced assets for 1929-1959. U.S. Census Bureau, Historical Statistics of the United States: Colonial Times to 1970, Summary of Federal Government Finances—Administrative Budget, 1789-1939, https://ia600407.us.archive.org/4/items/HistoricalStatisticsOfTheUnitedStatesColonialTimesTo1970/us_historical_statistics_colonial_times_to_1970.pdf. The American Business Cycle: Continuity and Change, Appendix B (Robert J. Gordon ed., University of Chicago Press 1986), http://www.nber.org/data/abc. Competitive Enterprise Institute, Clyde Wayne Crews, Ten Thousand Commandments 2013 (May 21, 2013), http://cei.org/studies/ten-thousand-commandments-2013. See CCH Standard Federal Tax Reporter, Federal Tax Law Keeps Piling Up (2013), http://www.cch.com/taxlawpileup.pdf. Over the period 1900-1930, approximately half of civilian federal employees worked for the Post Office Department. U.S. Census Bureau, Historical Statistics of the United States: Colonial Times to 1970, Series Y 308-317, Paid Civilian Employment of the Federal Government: 1816 to 1970, https://ia600407.us.archive.org/4/items/HistoricalStatisticsOfTheUnitedStatesColonialTimesTo1970/us_historical_statistics_colonial_times_to_1970.pdf. Id. at Series Y 352-357, Federal Government Receipts-Administrative Budget: 1789 to 1939; Series Y 358-373, Internal Revenue Collections: 1863 to 1970. Although the expenditures total did not change much, there were some huge compositional shifts, notably a major increase in federal transfer payments and other “entitlements” and a decline in federal defense spending. As a reminder, the receipts, expenditures, and deficits reported here are based on NIPA methodology, which differs from the numbers that appear in the federal budget. According to the federal budget, the government also posted surpluses in 1951, 1956, 1957, 1960, and 1969. See Office of Management and Budget, Historical Tables, Budget of the U.S. Government, FY 2014, Table 1.2—Summary of Receipts, Outlays, and Surpluses or Deficits (–) as Percentages of GDP: 1930–2018, http://www.whitehouse.gov/sites/default/files/omb/budget/fy2014/assets/hist.pdf. However, even if one looks only at the official federal budget, it is still evident that deficits have become the norm and surpluses the exception. The rebound in receipts is due to both the recovery and the tax increases enacted as part of the “fiscal cliff” deal at the beginning of 2013. See U.S. Census Bureau, Historical Statistics of the United States: Colonial Times to 1970, Series Y 710-735, State Government Revenue, by Source: 1902 to 1970; Series Y 736-782, State Government Expenditure, by Character and Object, by Function, and State Government Debt: 1902 to 1970; Series Y 796-816, Local Government Revenue, by Source: 1902 to 1970; and, Series Y 817-848, Local Government Expenditure, by Function: 1902 to 1970. U.S. Census Bureau, State & Local Government Finance, Historical Data: 1992, http://www.census.gov//govs/local/historical_data_1992.html. U.S. Census Bureau, Jeffrey L. Barnett & Phillip M. Vidal, State and Local Government Finances Summary: 2011 (July 2013), http://www2.census.gov/govs/local/summary_report.pdf. Total government receipts do not equal those of the federal government plus those of state and local governments, because BEA nets out inter-governmental transfers when calculating the NIPA data for the overall government sector. The same is true on the expenditures side.